Peter Adelaide Condos is a new per-construction Condo project located at 102 Peter Street. It located between Peter Street and Adelaide west in Toronto. Developed by Graywood Development. Peter Adelaide Condos features conjoined residential towers with apparent heights of 47 storeys. Peter & Adelaide Condos will bring 696new residences to the heart of Toronto’s Entertainment District.Peter & Adelaide Condos Designed by BBB Architects.Price starting from High $300’s. Peter & Adelaide is a condominium that embodies what it means to be made in Toronto. Designed for the city, in the city, Peter & Adelaide is located at the centre of culture and connection. At the intersection of art and commerce, work and play. Discover what it feels like to be made in Toronto. 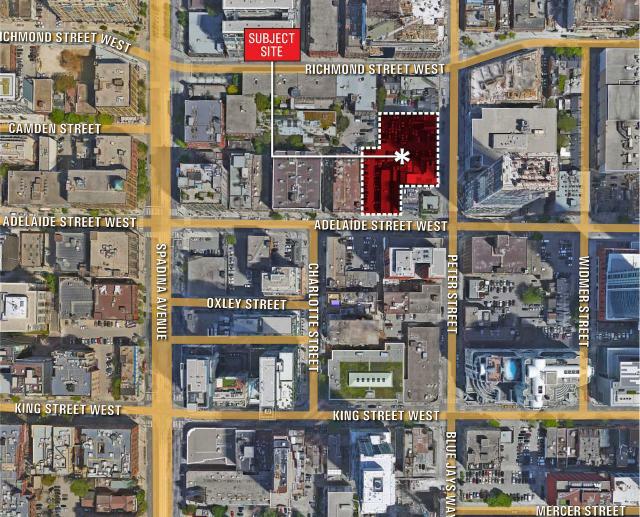 Peter Adelaide Condos will the demolition of four properties, including two 3-storey commercial buildings at 350 and 352 Adelaide Street West, a 3-storey building at 102-108 Peter Street, and the south half of a converted semi-detached dwelling at 118 Peter Street. A commercial surface parking lot containing approximately 75 spaces would be replaced by the new development. Peter Adelaide Condos has a Walk Score of 100 out of 100. Transit score of 100 out of 100. This location is in the Waterfront Communities-The Island neighborhood in Toronto. Nearby parks include Clarence Square, St. Patrick’s Square and Grange Park Toronto.